This is the Troika II. 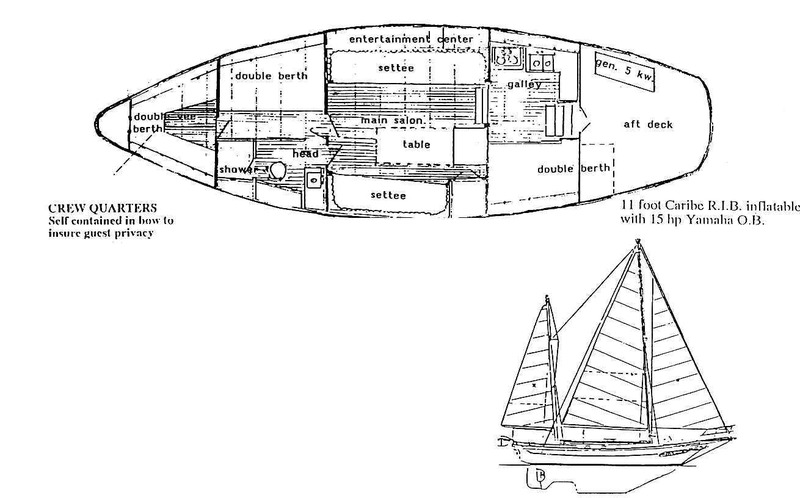 A 46 foot Atlantic Clipper ship, with a Ketch Rig Sail. The Troika II is the Crown Jewel of Sailboat Charters of Miami. Come sail away on a sailboat Charter with us on this beautiful all wood sailboat. Sailboat Charters do not get any better! EACH CABIN HAS OVERHEAD HATCHES AND SIDE PORTS FOR EXCELLENT VENTILATION. MAIN SALON WITH TABLE SEATING (4)... DINETTE TABLE SEATING FOR SIX. ENTERTAINMENT CENTER INCLUDES DATRON MARINE DSS SATELLITE RECEIVER. ROOMY UPHOLSTERED COVERED AFT COCKPIT WITH SUN AWNING.